Vernacular development (solo, duo, etc) is a key "Element of Mastery" practiced by the Association for the Advancement of Creative Musicians (AACM) and other Kemetic-inspired institutions when training young musicians to express their narrative voice, embodied experience, and emergent wisdom. In Music, like a vernacular language--its the language that people speak for conversation amongst themselves--so, music that's learned and taught and passed-on by ear and in the memory. Developing 'figures of/in speech', a personalized, disciplined approach, and other Music Research Strategies enable the artist to bend, reshape and transform the instrument they chose. “Oppositional Consciousness” is cultural work platform for the development of the solo voice. Catering - Healing Kitchen "100% Vegan Cuisine with Afrikan and New Afrikan Inspiration." This series is further inspired by Trinh T. Minh-ha, Julia Oparah (nee Sudbury), Saidiya Hartman and Chela Sandoval and many other International & US Third World Feminists authors who have impacted my personal and social life through their rigorous commitment to the necessity for demonstrating just how "oppositional" we need to be. Their writings, respectively, on post-coloniality, women & writing, the Black (& South Asian) Women’s radical organizing in the UK,” "forms of terror and resistance that shaped black identity" to Revolutionary Love, “technologies” of oppressed peoples' resistances, and much more, have, both generally, and specifically, taught me how to fight, teach, and be in & for the world. It's been over 25 years since I first heard Free Jazz and, "read" it as a "liberatory technology" in the same light as these and other oppositional modes of thought. This is a site-specific performance is to be held at El Quiilombo, formerly The Hold Out (theholdout.org), located at 2313 San Pablo Ave, Oakland, CA 94612 and other venues that designated as democratic spaces. Donations accepted at the door will benefit the use of the event space. 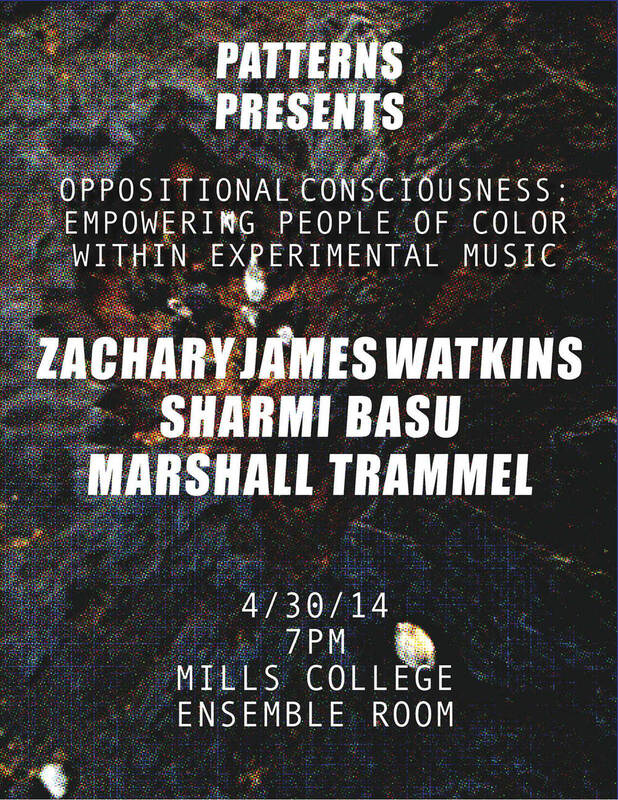 "Oppositional Consciousness: SVS" is the latest iteration of the Decolonizing the Imagination Creative Music Series spearheaded by Marshall Trammell (http://specialuniverse.wix.com/specialuniverse,www.BlackSpirituals.com).